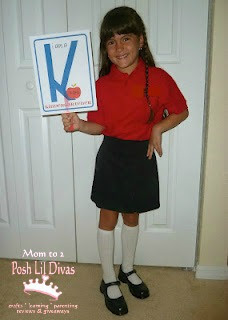 It's hard for me to believe that one of my "babies" is headed to Kindergarten! Where did the last 5+ years go? I have been preparing her for the big milestone - going to "big girl" school - for the past year. Both of my Lil Divas attended preschool a few hours a week and I feel this has been highly beneficial for their socialization, growth and learning. This year the Oldest Diva was enrolled in a State Funded Pre-Kindergarten program in her preschool. The program was 5 days a week from 9am to 12pm. Although it is a wonderful program - it is only 3 hours of their day. Much of my Lil Diva's learning still takes place with me in our home. I believe in grasping our teachable moments. I know that young minds are sponges and this is the ideal time to encourage their curiosity and awaken their desire and willingness to learn. These things are crucial not only to later successes in learning but life in general. Being a teacher has helped me quite a bit with this process but I realize not everyone has an education background so I thought it would be great to share a few of the basics/fundamentals that most (if not all) Kindergarten Teachers expect a child to be able to do or know when they start school. Keep in mind things may vary state to state but I believe the basics I am highlighting here are universal. 1. Does your child know their full name? This may seem silly but I have been in Kindergarten classrooms where children do not know their last names. They are expected to know their full names - including middle names if they have one so be sure your child knows theirs. They should also know how to write their own name. 2. Does your child know your telephone number? This is a safety issue - your child should know how to reach you in case of an emergency. Make sure they know (or have written somewhere) a number where someone will likely answer the phone. In this day and age a cell phone number might be the best option, especially if parents work outside the home. 3. Is your child able to sit and listen to a story without interrupting? In Kindergarten children must be able to concentrate on what the teacher is saying, listen and follow simple directions, etc. The best way to prepare children for this is to sit and read with them and encourage them to focus on the story. This helps foster retention and understanding. To encourage them to be able to follow simple commands - practice at home. Give your child simple 2 or 3 step directions such as - pick up the toy from the floor, put it into the toy box and close the lid. This will prepare them for when their teacher asks them to complete work at school. 4. Does your child speak clearly? Strong oral language skills are very important in school. If you suspect a speech delay or problem it would be wise to address the issue and bring it up to your child's teacher. 5. Is your child independent? While at school your child will be expected to manage bathroom needs independently. This includes fastening and unfastening simple buttons, putting on and taking off their coats, etc. Encourage this at home so that they feel confident doing these things for themselves before school starts. Tying shoelaces is NOT expected - this is developmental and many children do not learn this until 1st grade or so. If your child does not know how to tie their own shoes I recommend using shoes or sneakers with velcro or straps. It becomes tedious and tiring for a teacer to tie children's shoelaces all day long! 6. Does your child have strong fine-motor skills. A typical day in Kindergarten involves cutting, coloring, pasting, holding a pencil or crayon, etc. Beginning writing depends on these types of skills so be sure to spend some time engaging in these types of activities at home so your child is familiar with them. 7. Does Your child have basic letter and number recognition knowledge? Though complete letter mastery is not expected going into Kindergarten, it is ideal. Minimally, your child should know the letters in their name and as many of the other letters as possible. Honestly, even though it isn't a requirement in every state - basic letter knowledge is very important. It is the foundation on which learning to read is built. The more your child knows, the easier it will be to transition to learning phonics and reading skills in Kindergarten. Children are expected to be able to count from at least 1-10 and be able to recognize these numbers as well as know basic shapes and colors. Most children will know more than this (that is awesome!) - remember these are basic starting points. An important thing to remember is that children starting Kindergarten will be varied in their knowledge and skills. There are children who have been attending preschool and learning at school or at home for years. There will also be children for whom Kindergarten is their first school experience. 8. Does your child have good social skills? Much of Kindergarten involves working and getting along with others. Your child should be able feel comfortable doing this. Help your child refine essential social skills such as turn-taking, sharing, compromising and problem-solving. 9. Is your child eager to learn and curious about the world around them? Children develop at different rates but when a child is eager to learn and not afraid to try somehting new - they will be successful in school. Encourage your child to explore by asking questions, taking trips to zoos and museums, reading different types of books of books from the library, etc. This is the time to awaken and celebrate their curiosity and desire to learn! 10. Does your child show interest in books? If your child tries to "read" a book by telling a story based on the pictures - this is a sign that they are ready to start learning how to read which is part of Kindergarten. If your child does not show much interest in books - try to foster their interest. You can do this by reading to them daily and using fun voices and expressive reading to engage them, asking them questions, inviting them to join in on repetitive parts, and encouraging them to take participate in any active/action parts of the story. If you read through the above checklist and answered yes to all of the questions then your child is at a wonderful readiness level for Kindergarten! Continue to do what you are doing because you are on the right path. If you answered no to a few of the questions, then now you know what you can spend some time focusing on. Please know this should not be a burden. Make it fun and you will both benefit from the experience. If you answered no to most of the above questions then I suggest you look closely at your child's situation and possibly discuss it with your doctor or preschool teacher if your child has one. If developmental delays are suspected - it is important to seek out the necessary help. I hope that you find my little list useful. By no means am I suggesting I am an expert but after 12+ years of teaching you learn a thing or two. I am merely passing my learned tidbits on to you in the hopes that it will help you and your child have a successful transition into Kindergarten. I didn't realize you were a teacher. What grade do you teach? I know what you're going through. My oldest is also in a state funded EAK (early acceptance to kinder) program. He loves it but 3 hours is still not enough. Though he had gone into already prepared to learn. His teacher recently gave progress reports and has mentioned that my son has over excelled in their curriculum already. WOAH. I didnt know what to say. So needless to say, his teacher believes he is of course ready for Kinder and will absolutely enjoy it. Funny is that he's also completely opposite at school than he is at home. His teacher praises him about how polite, respectful, sharing, a leader..etc at school, but he's so opposite at home. As a teacher yourself, is that normal of most kids? I wanted to comment back to you via e-mail but didn't see it listed on your blog! I am currently a SAHM and substitue teacher while my lil ones are too young to attend full time. When I was working full time within the classroom I taught a few grades over the years including Pre-K, 1st 2nd, 3rd and Spanish for early childhood. My fave was the younger grades. It would be my ideal to teach Pre-K or Kindergarten when I go back full time in the next 2 years. Thanks for your response. Not sure what happened to my Profile on my blog. Hmm...I will have to fix that. Glad to hear it's not just my child. When reading my son's weekly progress reports, I too thought it had to be another child! I do get to see how he is at school and I am still surprised. I volunteer every Tuesdays and from time to time I will look up to see how he is. That's great your children have such an all around Mom at home too. That totally helps. My BFF is a 2nd grade teacher and she helps me with curriculums and school ready stuff all the time. Best of luck to your and your daughter for Kindergarten. I'm sure we'll be in touch with more stories! It is such a special day for the kids and moms on the first day of kindergarten it is almost painful when they walk away to get on that bus or walking into the school. You will be sure to feel that way again when they leave for college. I love this post! My little one i still small but it's never early to get ideas like this. I'm following from welcome wednesday blog hop! I hope you could follow back. Thanks! thanks for the ideas to prepare. my daughter is starting 4yo preschool in the fall and we seem to be on target. working on her phone # now but having some troubles. i'm sure it will come though. "They're not expected to know their ABC's going into Kindergarten." Seriously? They should know those frontwards and backwards before starting K.
It is NOT a requirement here and a child will get into K without knowing how to write them all. They do review letters in Kindergarten - both sounds and formation. I teach Kindergarten in MO and with the Common Core standards that most states are now adopting, no it's not required for kids to know their ABCs and they can learn them in K, BUT it's much easier if they do know them! Kinders are expected to start "reading" and "writing" week 1--even though at that point it's simply looking at the pictures and talking about them, and making letter strings and pictures on a page, for some kids. But honestly, the more they know, the easier it is for them and for the teacher! I have some students who came in knowing some sight words already, so I now have them in an enrichment reading group with me and they also write differently than the rest of the class sometimes--so a good teacher will continue to push your child to succeed. I'm not telling you to teach your child early so the teacher doesn't have to--just saying that if you teach your child the foundational skills before kindergarten, nobody (including you) will have to stress about it during the year, and you and your child and the teacher can focus on how high your child can go instead of just getting them up to par. As both a teacher and a parent, I agree with you Anna Lynn. Having a solid foundation makes learning much easier. Both my girls went to kindergarten knowing how to write, letter sounds and knew some basic sight words. It made all the difference and they have continued to achieve and are now excellent readers. Unfortunately, not all children will have this foundation. One thing I have noticed is that kindergarten classrooms tend to have children at both ends of the learning spectrum and everywhere in between. It's not an easy grade to teach and yet it's highly rewarding to see how far they get in that year. Thanks so much for stopping by and sharing your experience with us.